Various events were scheduled around San Diego County Tuesday to commemorate and pay tribute to the victims of the terrorist attacks of Sept. 11, 2001. San Diego Miramar College’s fire tech program held two memorial events, at 9 and 11 a.m. The first ceremony was a formal remembrance by members of the program and included the ringing of a fire bell in honor of the 343 firefighters killed in New York. At 11 a.m., the school presented displays honoring first responders, including 412 flags planted in Compass Circle for the 412 first responders killed. Ron Edrozo, a fire protection technology adjunct professor at Miramar College, took part. He served on an urban search and rescue team sent from California to Ground Zero in the wake of 9/11. “They always ask `what did it look like?’ and it’s hard to explain,” Edrozo said of Miramar’s fire tech students. “I usually try to tell them like the Grand Canyon, made out of metal,” Edrozo told KUSI. San Diego State University and members of the Reserve Officers’ Training Corps held a flag-lowering ceremony Tuesday morning that drew the annual event’s largest crowd in 10 years, according to Paula Pierce, department secretary of Aerospace Studies and the school’s Air Force ROTC program. Shortly after lowering the flag to half-staff, ROTC members raised it again to “recognize our joint spirit of resolve,” said SDSU Theatre, Television and Film professor Randy Reinholz. 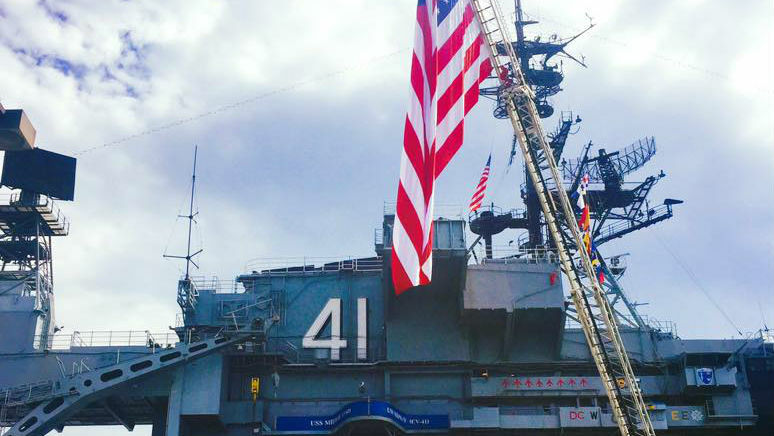 At 2:30 p.m., the USS Midway Museum planned to hold a memorial ceremony with the FDNY Retirees of San Diego, the Wounded Warriors Project, and the National City and San Diego fire departments. Billed as the largest 9/11 memorial on the West Coast, the ceremony was scheduled to include a reading of the names of first responders killed in the attacks, a 21-gun salute, the playing of Taps and a Harbor Police fireboat water display. Gallop called the proclamation “bittersweet” as he paid tribute to officers killed in action while noting that he was fortunate to be able to reach retirement. “Odie is an icon of what it means to be San Diego’s finest,” said City Councilwoman Myrtle Cole.